New Zealand moved a step closer to ending their 24-year World Cup wait as they overpowered arch-rivals Australia with a controlled semi-final display. The Wallabies had beaten the All Blacks in the semis of both 2003 and 1991 but were rocked by a blistering start and never truly recovered. An early try from Ma'a Nonu and six points from the misfiring boot of Piru Weepu gave the home side a 14-6 lead at the interval. And with the All Blacks forwards in the supremacy and Australia's key men Quade Cooper and David Pocock unable to exert a decisive influence, two second-half penalties sent a capacity Kiwi crowd away into the Auckland night in delight. New Zealand will now meet France in Sunday's final, and on the evidence of this weekend should start as hot favourites to win their first World Cup since 1987. The Wallabies were immediately on the back foot when Cooper put the kick-off directly into touch and then watched as Weepu drilled a low kick into the corner to pile on the pressure. It was all New Zealand, Cory Jane and Israel Dagg both threatening with scything runs, and it was a burst through midfield from the impressive Dagg that brought an inevitable first score - Rocky Elsom was handed off, O'Connor unable to prevent a wonderful off-load as Nonu came up inside to power over in the corner. Weepu missed the conversion and then a straightforward penalty after Pocock - ominously for Australia - was pinged for going off his feet. A side-stepping run from Digby Ioane set up a penalty for James O'Connor on Australia's first foray into opposition territory but Cooper then spilled an up-and-under to cede possession again, Weepu making it 8-3 with a simple penalty but then missing an even easier one. Aaron Cruden, third choice fly-half a fortnight ago, was orchestrating the attacks well and nailed a drop-goal from distance to dispel any fears that the occasion might be too much for him. Australia lost tight-head prop Sekipe Kepu to injury but then finally began to get into the game. A series of drives from the forwards gave Cooper the opportunity to pop over a drop-goal, but a daft offside from Adam Ashley-Cooper allowed Weepu to extend the lead to 14-6 with a penalty from 40 metres just before the interval. The Wallabies had missed 15 tackles in the first period, and they slipped further behind almost immediately as Pat McCabe held on in the tackle and Weepu stroked over his third penalty. Neat footwork from their much-vaunted backs gave them good field possession but handling errors repeatedly took the wind from the green and gold sails. Cooper was being booed and jeered with every unhappy touch, Pocock having nowhere near the same success against Richie McCaw at the breakdown as he had in the quarter-final win over the Springboks. The All Blacks forwards' increasing dominance at the scrum gave Weepu a long-distance pot which fell short before Dagg sliced a drop-goal attempt horribly. 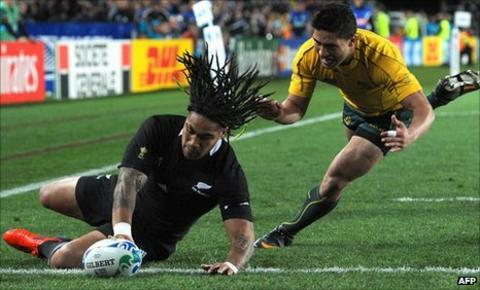 But the Wallabies' tight five were being mangled at every set piece. When another scrum collapsed under intense pressure, Weepu - back on as a blood replacement for Andy Ellis - made it 20-6. Although replacement Sonny Bill Williams spent the last five minutes in the sin-bin for a shoulder charge on Cooper, the tired Wallabies could make no impact with the extra man. As the final whistle sounded the home crowd celebrated by bellowing "Four more years!" in happy reference to Wallaby scrum-half George Gregan's famous taunt after that 2003 Wallaby win. Just seven days and an under-performing French side now stand between the All Blacks and the ultimate rugby redemption. New Zealand: Israel Dagg; Cory Jane, Conrad Smith, Ma'a Nonu, Richard Kahui; Aaron Cruden, Piri Weepu; Tony Woodcock, Keven Mealamu, Owen Franks, Sam Whitelock, Brad Thorn, Jerome Kaino, Richie McCaw (capt), Kieran Read. Replacements: Ali Williams (for Whitelock, 57), Andy Ellis (for Weepu, 57, Weepu back on - blood - 69), Andrew Hore (for Mealamu, 64), Sonny Bill Williams (for Nonu, 72), Ben Franks (for O Franks, 79). Not used: Victor Vito, Stephen Donald. Australia: Adam Ashley-Cooper; James O'Connor, Anthony Fainga'a, Pat McCabe, Digby Ioane; Quade Cooper, Will Genia; Sekope Kepu, Stephen Moore, Ben Alexander, Dan Vickerman, James Horwill (capt), Rocky Elsom, David Pocock, Radike Samo. Replacements: James Slipper (for Kepu, 18), Rob Simmons (for Vickerman, 22-26, then 60), Berrick Barnes (for McCabe, 34-40, then 47), Ben McCalman (for Samo, 60), Rob Horne (for Fainga'a, 62), Tatafu Polota Nau (for Moore, 65). Not used: Luke Burgess.